Once upon a time two sweet summer children fell in love. Around them crooked businessmen plotted, criminals schemed, family tragedies abounded, but nothing corrupted these too-pure children from anything but the cinnamon rolls they always were. Ji Sung, known mostly by his nickname Louie (a reference to decadent French kings I guess? He does start the show living in his mansion in France), is a chaebol who gets amnesia and encounters Bok Shil. Bok Shil is a bumpkin from the mountains who came to Seoul in search of her missing younger brother, and encounters Louie wearing said brother’s clothes, with no memory of how he came to possess them (or of anything, really). Bok Shil sticks to Louie in hopes of learning what happened to her brother, and Louie sticks to Bok Shil because he has nothing else. Meet my new crazy haired children. – Louie’s grandmother lost all of her family aside from Louie, and literally all she cares about is loving people. She instantly adores Bok Shil. It’s pretty clear she would instantly adore anyone Louie does. – The corrupt businessman is presented as a complex human being rather than a mustache-twirling archetype. He hires the world’s most hilariously inept minion. He never means to hurt anyone, confesses to his crimes on his own, and is forgiven by both Louie and Bok-Shil. – Although Louie is a chaebol and Bok Shil a poor girl from the country, the show maneuvers around the negative power differentials common in such kdrama relationships. The amnesia, rather than being mined for angst, serves to first level the playing field between Louie and Bok Shil. They’re both pretty much helpless lost puppies in Seoul, as one police officer points out, and Bok Shil’s above Louie in power early on in the drama because she’s the breadwinner with any survival skills. “Found this boy in the gutter, now I shall keep him” is my new fave kdrama aesthetic. Even once Louie regains his memory, the power balance between the two isn’t in practice upended against her. Louie instantly wants to share all of his money with her, rather than belittling her and lording in his position over her (and none of the people around him do this either. It sounds horrific on paper, but it’s depressingly common in kdramas, even in some wildly popular ones). Even a Louie with his full memory is still helpless in the real world. Because his grandmother lost her husband, son, and daughter-in-law tragically, she kept Louie wrapped in wool his whole life. He was barely allowed to leave the house or drive a car, let alone actually interact with the world. Amnesia!Louie frankly isn’t that much more innocent/naive than regular Louie. It helps that Louie and Bok Shil go from being literally dependent on one another to emotionally dependent, happy, and adoring of each other, and always stay that way. Somehow two of the most wide-eyed, innocent lead characters in kdramaland end up with one of the healthiest, most functional kdrama relationships (or any love story relationships) I have ever seen. Actually, that’s not a “somehow,” it’s clear how it happens: they keep their affection for each other forefront, are always honest with each other, and the show foists no unnecessary drama upon them. It is magical. My children and their sweetness make everything better. 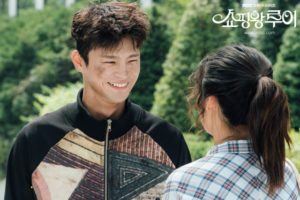 My only complaint about this drama is that no matter how much I like actor Yoon Sang Hyun, the ridiculous fashion his second male lead character carries off here, or the begrudging grumpy dad role he eventually settles into over Louie and Bok Shil, the actor and the character here are much too old to be considered viable romantic partners for Bok Shil. The show had to go and make it worse in the last episode, when it decisively establishes that “innocent but determined country girl in her early 20s” is his type. Kdramaland, you have got to stop this immediately, it’s gross and inappropriate. Maybe Shopping King Louie isn’t all that realistic, but sometimes realism is overrated, or more probably, grittiness, angst, fighting, darkness, and gloom are overemphasized facets of realism in fiction. Idealism, hope, love, acceptance, and kindness are just as important, and we find all of them in Shopping King Louie.